Carole Hensher was an elected Fellow and former Council Member of the Royal Society of Painter Printmakers. In tribute to the artist, a memorial selection of work spanning her career was included in the Society's national exhibition Original Prints 2015 (May 8 to June 6, 2015) at Bankside Gallery, adjacent to Tate Modern on London's South Bank waterfront. Carole was an enthusiastic member of this thriving artists' cooperative and gallery for many years. Southbank Printmakers arranged a special memorial exhibition of her work which ran from May 4 to May 17, 2015. The gallery is situated in Gabriel's Wharf, an attractive Thames-side location between the Oxo Tower and the National Theatre. Southbank Printmakers, 12 Gabriel's Wharf, 56 Upper Ground, London SE1 9PP, 020 7928 8184. An exhibition of original prints by members of the London Printmakers group ran from 23rd June - 6th July 2014. Prints by Carole Hensher and fellow members of the Royal Society of Painter Printmakers were on display at the prestigious London Original Print Fair at the Royal Academy of Arts, Burlington House, Piccadilly, London W1J 0BD. April 2014. Prints and 3D constructions by Carole Hensher were shown at London's prestigious Blackheath Gallery where Print Exhibition 2014 alongside prints by internationally-known artists from both sides of the Atlantic. View illustrated exhibition brochure. The Station gallery and arts centre in Richmond, North Yorkshire hosted an exhibition of work by 12 leading London printmakers including Carole Hensher from November 2013 to January 2014. Details. Prints by Carole Hensher were shown at the Summer Exhibition of the Royal Watercolour Society and the Royal Society of Painter-Printmakers at Bankside Gallery. August to September 2013. Royal Society of Painter-Printmakers Annual Exhibition The Society's 2013 Annual Exhibition at Bankside Gallery, which included work by Carole Hensher, was opened by Tate Britain's Prints & Drawings Room Curator, Julia Beaumont-Jones. May - June 2013. Prints by Carole Hensher and fellow members of the Royal Society of Painter Printmakers were shown at the prestigious London Original Print Fair at the Royal Academy of Arts, Burlington House, Piccadilly, London W1J 0BD. April 2013. Several prints by Carole Hensher were included in Artists in Print, a dynamic exhibition at the Tunnel Gallery, Tonbridge, featuring lithographs, silkscreens, mono prints and etchings made by professional printmakers living and working in London. April - May 2013. The Mini Picture Show, featured works on a small scale by members of the Royal Watercolour Society and the Royal Society of Painter-Printmakers at Bankside Gallery. November 2012 - January 2013. The Summer Art Show at the Everyman Gallery, 50 Beech Road, Chorlton, Manchester, M21 9EG, Tel 07727 143 402, www.everymanartgallery.com The exhibition also featured work by Rego, Hockney, Emin, Remfry and Frink. The Printed 2012 Exhibition at the Blackheath Gallery, 34a Tranquil Vale, Blackheath, London SE3 0AX. Tel 020 8852 1802. www.blackheath-gallery.co.uk (August - September 2012). London Printmakers - Where's the Original? An exhibition of original prints by members of the London Printmakers organisation at Bankside Gallery (September 2012). Work by Carole Hensher was shown in the Society's 2012 Annual Exhibition (May to June) and the Summer Exhibition (June - July) at Bankside Gallery, 48 Hopton Street, London SE1 9JH (next to Tate Modern on the South Bank). Tel 020 7928 7521 email info@banksidegallery.com. Prints and 3D work by Carole Hensher was on show in the London Printmakers exhibition at the Olivier Exhibition Space, National Theatre, South Bank, London (March 12th to April 21st 2012). Carole Hensher exhibited with the Royal Society of Painter Printmakers at the London Original Print Fair at the Royal Academy of Arts, Burlington House, Piccadilly, London W1J 0BD, April 19th - 22nd 2012. Carole Hensher was an invited artist at the Pure Arts Group Spring Exhibition Celebrating Print in Battle, East Sussex (April 2012). Work by Carole Hensher was shown by Triangle at the Affordable Art Fair in Battersea Park, London from March 15th - 18th 2012. Prints and 3D work by Carole Hensher were shown at London's Blackheath Gallery from January 14th to February 25th 2012. The exhibition included work by Blake, Hoyland, Picasso and Warhol. 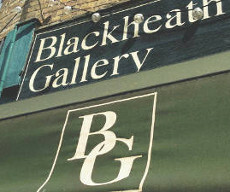 Blackheath Gallery, 34a Tranquil Vale, Blackheath, London SE3 0AX. Tel 020 8852 1802 / 07714 104 204. Prints by Carole Hensher were exhibited at Galerie LebensArt in Gross Umstadt, near Darmstadt and Frankfurt, Germany in an exhibition of work by members of Half Moon Studio. (September - November 2011). The exhibition 'Bite: Artists Making Prints' (previously known as 'Originals')at London's well-known Mall Galleries, The Mall, near Trafalgar Square, SW1 included work by Carole Hensher. In addition to work selected by open entry, the show also featured prints by Damien Hirst, Sir Peter Blake RA, John Hoyland RA, Barbara Rae RA and other invited artists. (August - September 2011). Prints by Carole Hensher were on show in the Society's 2011 Summer Exhibition at Bankside Gallery, 48 Hopton Street, London SE1 9JH (next to Tate Modern on the South Bank). Tel 020 7928 7521 email info@banksidegallery.com. (July - August 2011). Work by Carole Hensher was included in the Society's 2011 Annual Exhibition at Bankside Gallery, 48 Hopton Street, London SE1 9JH (next to Tate Modern on the South Bank) and subsequently at Burton Art Gallery and Museum, Kingsley Road, Bideford, Devon, EX39 2QQ. (April - July 2011). 'untitled' - organised by The Printmakers Council. Vyner Street Gallery, 23 Vyner Street, London E2 9DG. (July 2011). London Printmakers 2011 exhibition at gallery@oxo, Oxo Tower, Bargehouse Street, London SE1 9PH. (Between the National Theatre and Blackfriars Bridge). (April - May 2011). Carole Hensher exhibited with the Royal Society of Painter Printmakers at the London Original Print Fair at the Royal Academy of Arts, Burlington House, Piccadilly, London W1J 0BD, April 19th - 21st 2011. Prints and 3D work (left) by Carole Hensher were shown at the GPA exhibition ' Second Edition' at the Olivier Exhibition Space, National Theatre, South Bank, London (January to March 2011). This was a return visit to the NT by the Association following their successful 2009 exhibition, 'Lasting Impressions'. Listen here to the BBC London Radio interview with Carole about the 2009 show, the Association and her work. An exhibition of work by Printmakers Council members at the South Hill Arts Centre, Bracknell, September 11 to November 7, 2010. 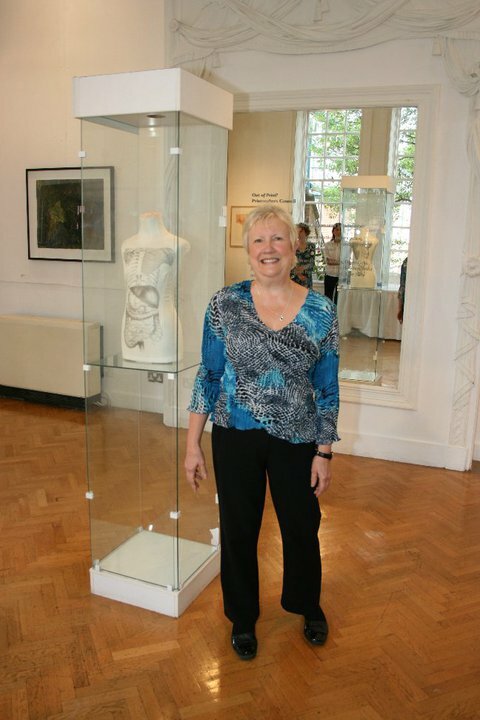 Carole Hensher is shown here in the Mirror Gallery at South Hill with her lithographed fabric sculpture Anatomy Lesson. An exhibition of work by Carole Hensher and Carol Gibbons at the Noverre Gallery, Norwich. August 1 to 31, 2010. View the exhibition poster for images and full information. The Annual Exhibition of the Royal Society of Painter-Printmakers, May 7 to June 5, 2010 at Bankside Gallery, 48 Hopton Street, London SE1 9JH Tel 020 7928 7521 email info@banksidegallery.com. The 25th London Original Print Fair at the Royal Academy of Arts, Burlington House, Piccadilly, London W1, April - May 2010. Carole's work was included in Originals10 at London's prestigious Mall Galleries, March - April, 2010. Carole exhibited with the Triangle Group (Carole Hensher, Meg Dutton and Sandra Millar) at the Affordable Art Fair - Spring Collection in Battersea Park, London in March 2010. The Christmas exhibition at Will's Art Warehouse, 180 Lower Richmond Road, Putney, London SW15 1LY Tel 020 8246 4840. 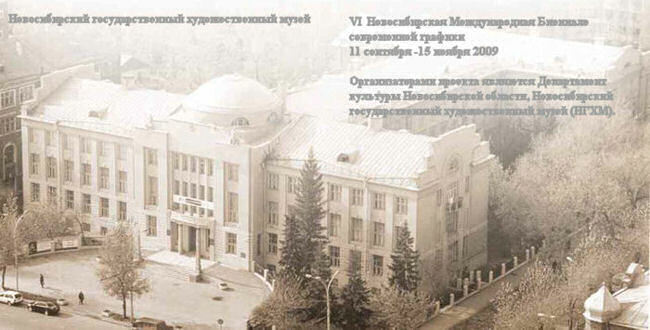 Three pieces by Carole Hensher were shown at this prestigious international exhibition at the Novosibirsk State Art Museum, September 11 - November 15 2009. Albion Studios showed the work of three artists: Carole Hensher, Meg Dutton and Jonathan Hensher at the Buy Art Fair at Urbis, Manchester in September 2009. Work by Carole Hensher was shown at the GPA exhibition ' Lasting Impressions - Greenwich Printmakers - 30 years on' at the Olivier Exhibition Space, National Theatre, South Bank, London (May - July, 2009). Listen to the BBC London Radio interview with Carole about the show. An exhibition to celebrate the thirtieth anniversary of the Greenwich Printmakers Association was held at The.gallery@OXO, Oxo Tower Wharf, South Bank, London (July - August, 2009). The Annual Exhibition of the Royal Society of Painter-Printmakers included work by Carole Hensher. The show ran from May 8 to June 7, 2009 at Bankside Gallery, 48 Hopton Street, London SE1 9JH Tel 020 7928 7521 email info@banksidegallery.com. Carole Hensher gave an illustrated talk about her work at London's Bankside Gallery on Thursday, May 14th, 2009. Carole Hensher exhibited with the Royal Society of Painter-Printmakers at the LOPF, Royal Academy of Arts (Main Galleries), Burlington House, Piccadilly, London W1, Wed 22 to Sun 26 April 2009, 10am - 6pm (Fri 8pm). Carole Hensher exhibited with the Triangle Group at the Affordable Art Fair Spring Collection (Battersea Park, London, March 2009). Work by Carole Hensher was shown at the Originals 09 exhibition at the Mall Galleries, The Mall, Near Trafalgar Square, London. February, 2009. North and South - a joint exhibition of work by London painter-printmaker Carole Hensher RE and Manchester artist Jonathan Hensher ran from May 26 - June 14, 2009, at the Paul McPherson Gallery, 77, Lassell Street, Greenwich, London SE10 9PJ, Tel 020 8269 2990. Click for brochure with information on both artists. Stop Press: IV Printmakers - This two-month autumn exhibition at the North-East's prestigious art location The Biscuit Factory , Stoddart Street, Newcastle Upon Tyne, NE2 1AN Tel 0191 261 1103, featured work by Carole Hensher RE. Items by the artist can also be seen on this gallery's website. For more details and photos of the exhibition, see separate page. Summer in the City - A joint exhibition of work by members of the Royal Watercolour Society and the Royal Society of Painter-Printmakers took place at the Bankside Gallery 48 Hopton Street (next to Tate Modern), London SE1 9JH Tel 020 7928 7521 throughout August, 2008. The show included prints and 3D work by Carole Hensher RE. Work by Carole Hensher was shown at the Society's prestigious annual show at Bankside Gallery, 48 Hopton Street (next to Tate Modern), London SE1 9JH Tel 020 7928 7521. May 1 - June 1, 2008. Work by Carole Hensher was exhibited at the London Original Print Fair by the Royal Society of Painter-Printmakers at the Royal Academy of Arts, London. Carole Hensher exhibited with the Triangle Group at the Affordable Art Fair Spring Collection in Battersea Park, London. March 2008. 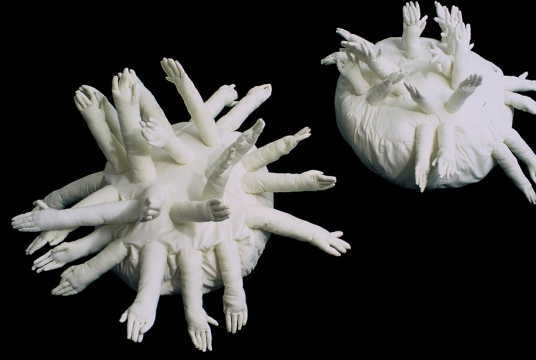 One of her prints was used in the national publicity for the exhibition and her 3D work, Glove Cushion,was selected for display in the main entrance hall. Glove Cushion and Glove Cushion II. Carole Hensher's work was on show at the Canary Wharf offices of Clifford Chance at 10 Upper Bank Street, London, E14 5JJ as part of an exhibition of work by members of Artichoke Printmaking. March 2008. Several items by Carole Hensher were shown at Originals 08 at the Mall Galleries, The Mall, Near Trafalgar Square, London. February 2008 (www.mallgalleries.org.uk). Work by Carole Hensher formed part of the 20+ Impressions exhibition, a three-week show at the.gallery@oxo at Oxo Tower Wharf, Bargehouse Street, South Bank, London, SE1 9PH. January 2008. Carole Hensher's work was included in this exhibition at the Staedtische Galerie Villa Streccius in Landau (Pfalz), Germany. December 2007 to January 2008. 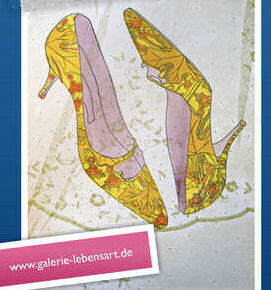 Staedtische Galerie Villa Streccius, Suedring 20, 76829 Landau/Pfalz Tel: +44 (0) 63 41 / 89 84 72. A Leaf from a Sketchbook This exhibition, which included work by Carole Hensher, gave a fascinating glimpse into the working methods of members of the Royal Society of Painter-Printmakers and the Royal Watercolour Society. It explored how prints and watercolours develop from initial artists' preparatory sketches into original works of art. The exhibition took place at the Bankside Gallery, 48 Hopton Street (next to Tate Modern), London SE1 9JH (2007). An exhibition, devoted exclusively to work by Carole Hensher and featuring prints, paintings and 3D pieces, was held at the Paul McPherson Gallery, Greenwich. March - April 2007. Prints by Carole Hensher were exhibited at the 2007 RaMoMa exhibition in Nairobi, Kenya. Originals 07 - Mall Galleries (Talk by Carole Hensher - Featured Artist). Carole Hensher was a featured artist at Originals 07 - the Contemporary Printmaking Show, where she gave a talk (click for details) about her work February 18th 2007. Originals 07 took place at the Mall Galleries, The Mall, near Trafalgar Square, London, SW1. OXO Tower - 20 impressions A three-week show at the.gallery@oxo at Oxo Tower Wharf, Bargehouse Street, South Bank, London, SE1 9PH (2007). 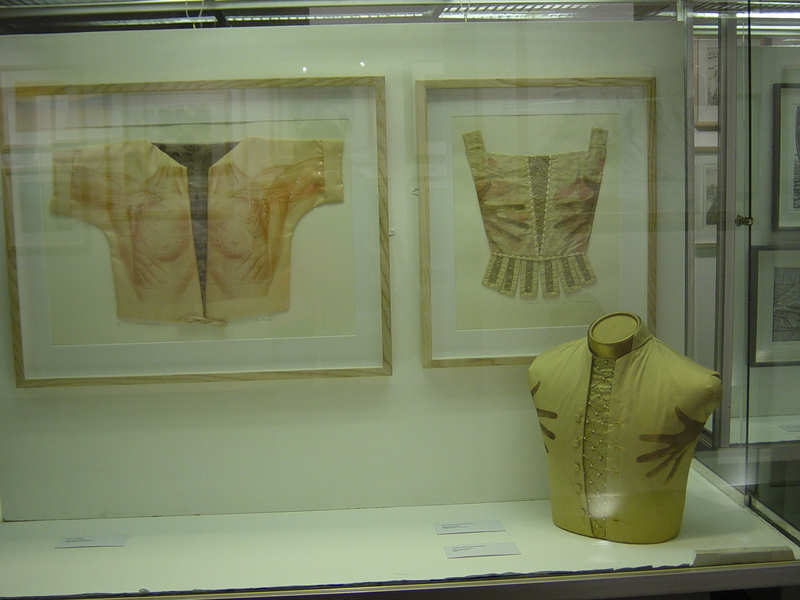 An exhibition of prints and fabric constructions by Carole Hensher took place in November 2006 at the Hepsibah Gallery in the Brackenbury Village area of West London. Royal Society of Painter Printmakers annual exhibition at Bankside Gallery (May - June 2006). 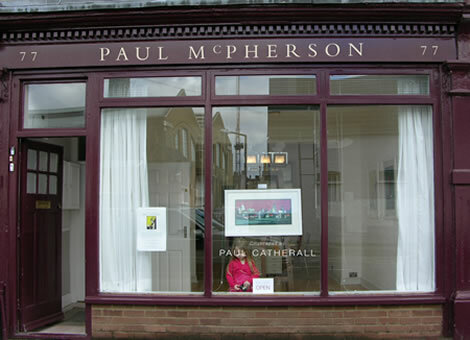 4th Ealing Open Art Exhibition at PM Gallery (April - May 2006). Originals 06 - Carole Hensher was a featured artist at the prestigious Originals 06: The Contemporary Print Show at the Mall Galleries opened by Sir Peter Blake on February 14th 2006. One of the artist's prints exhibited also appeared in the publicity for the event. Click for Originals06 info and brochure image. Bankside Gallery, London. 'Love for Sale: The Art of Sensuality'. January/February 2005. Click for full info and pictures. Mall Galleries, London. 'Originals 05'. February 2005. James Hockey Gallery, Surrey Institute of Art & Design, Farnham. 'In Print'. February/March 2005. Morley Gallery, London. 'Printed on the Mind'. November 2004. Blue Anchor Studio, London 2004. The Royal West of England Academy, Bristol. Open Print exhibition 2004. Tangible Art, Portland Place, London (September 2003). Fresh Art, Business Design Centre, Islington (July 2003). Wrexham Print International exhibition (April/May 2003 then touring). Printmakers Council exhibition, Fisherton Mill, Salisbury (May 2003). Words in Works exhibition, Beatrice Royal Gallery, Southampton (2002-2003). Contemporary Works exhibition, Boxfield Gallery, Stevenage (2002-2003). Tangible Art, Portland Place, London 2002. PM Gallery, 'LIFE/size' exhibition at Pittshanger Manor, 2002. Large floor-mounted lithograph on fabric by Carole Hensher selected. The Mall Galleries, London, 'National Print Exhibition' 2002 organised by The Federation of British Artists in conjunction with The Royal Society of Painter Printmakers. Printspace, London, Solo exhibition 2002. Guildhall Gallery, The Broadway, Winchester January 2002. Printspace, London, 'Multiple Impressions' 2001. Studio Voltaire, Clapham, Printmakers Council exhibition 2001. Hall Place, Bexley, Kent 'Lasting Impressions' 2001.
Business Design Centre, Islington, London 'Fresh Art' 2001. The Mall Gallery, London 'National Print Exhibition' 2001. The Royal National Theatre, London 'Printmakers Council Exhibition' 2001. 'Multiple Impressions': exhibition at Printspace, London SE1 (2001). Gallery Westland Place, London 'Beyond the Surface' (Printmakers Council). 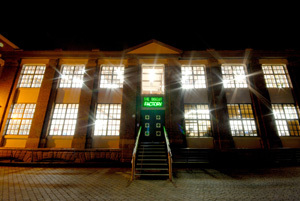 Leicester City Art Gallery 'Souvenir' 1999 - 2000. Contemporary Print Show, Barbican Centre, London 2000. Contemporary Print Fair London 1999. Watercolour C21: Bankside Gallery, London 1999. National Print Exhibition: Mall Galleries, London 1999. Cheltenham Open Drawing Exhibition: Cheltenham, Berlin and Hull 1998. The Figure Reinterpreted: Dulwich Picture Gallery, Dulwich 1994. Solo Exhibition: Whitgift School, Croydon 1991. Work by Carole Hensher is available for purchase from the following galleries and organisations.